Look what arrived in my mailbox! This beautiful print, from Katey at One Good Bumblebee. She had a wonderful sale last week on her gorgeous prints, and I just couldn't resist. 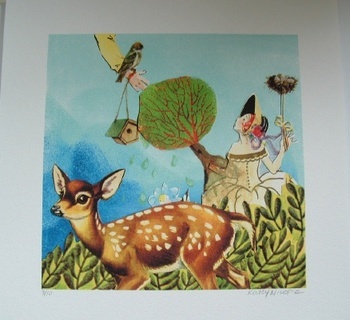 I love this one so much--the birdhouse, the deer, and the colors are so rich. Now, as soon as I can get motivated to frame this (and my Camilla print too), I'll have some lovely new art on the walls--Yeah!! A Kingpod creation is coming next I hope (dusty has stolen my heart), just as soon as I can stop spending all my Paypal money before it gets high enough (please tell me I'm not the only fool who can't even hold onto $20 without spending it! ).